Energy Efficiency Markets interviews Kenneth Reich, partner in WolfBlock’s Environmental and Land Use Practice Group in Boston. He discusses the need for federal policy to fix the outdated and inefficient US transmission system. A national energy policy must alleviate grid congestion, implement energy efficiency and demand side resources, and eliminate electric heat loss over long distances, he says. 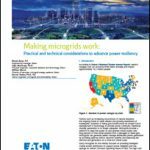 Microgrid Opportunity: What Stands in the Way for 2017?